Experts argue that large-scale US-ROK joint military exercises, the kind that North Korea finds highly provocative, are a key factor in maintaining deterrence, preparedness for conflict and interoperability, and overall military readiness. Nonetheless, the goals of reducing tensions and putting US-DPRK negotiations back on track, particularly given the disappointing outcome of the Hanoi Summit, should be the yardstick for calculating the risks and rewards of all current and proposed military actions. If the potential benefits of large-scale military exercises are outweighed by the diplomatic risks of antagonizing North Korea at a delicate time in its engagement with both Washington and Seoul, they should be indefinitely canceled and replaced with less costly and more innovative alternatives. The ebb and flow of diplomatic relations over the past several decades dictated the scale and scope of exercises, but the deterrent impact on North Korea remains difficult to assess. Major seasonal exercises under the newly established Combined Forces Command (CFC) began in 1978. That same year the springtime event Foal Eagle, the largest and most controversial joint exercise with South Korea, was established and Key Resolve was added in 2002. Similarly, the fall exercise Ulchi Focus Lens, later renamed Ulchi Freedom Guardian, also commenced. These exercises did not deter North Korea from developing nuclear weapons and ballistic missiles. In fact, these capabilities have rapidly improved since the mid-1990s, notwithstanding seasonal exercises being continuously held with few exceptions. Short-term deterrence has been achieved in several instances in the past, but the long-term impact and overall trend commencing with the 1978 establishment of exercises is undeniably negative. While these exercises serve mainly to underscore the US security commitment to the ROK and, by extension, deter aggression, analysts insist the prevention of belligerent/provocative behavior is an expected result. This is also difficult to assess given the consistent presence of the US military in South Korea and its deterrent effect, as well as the US nuclear umbrella over the South. Conflict on the peninsula has not been absent, and in some cases, exercises inflamed tensions. The 2010 attack on Yeonpyeong Island proves the failure of assumptions regarding the preventive effects of exercises, scale and timing of the attack, one of the worst clashes since the cessation of hostilities, suggests that the exercises held that year were a contributing factor to the North Korean provocation, providing Pyongyang with cover to demonstrate its military might and political resolve with little likelihood of significant reprisal. The second oft-cited benefit of large-scale exercises is interoperability and preparedness for armed conflict with North Korea. From a command and control (C2) perspective, there are advantages to having US-ROK and joint US force exercises but C2 functions rarely necessitate an event as grand as Foal Eagle or Ulchi Freedom Guardian. Currently, Command Post Exercise (CPX) computer simulations used during Key Resolve and, more recently, Dong Maeng (formerly Key Resolve) are being utilized to execute practice C2 functions without the scores of personnel reserved for traditional exercises. Rapid turnover of junior and senior military personnel presents a consistent problem for proficiency and the maintenance of specialized skills. Personnel permanently stationed in the area gain the most benefit, but large exercises generally incorporate temporarily assigned units from outside of the region which increases the proficiency of potential combatants only in the very short term. The nature of this arrangement generates minimal continuity in experience and provides little permanent regional benefit. To mitigate this, small-scale exercises involving deployable units conducted elsewhere (e.g., Guam, CONUS) should focus on future integration as a central part of all scheduled events. Adaptability to various environments is a hallmark of a proficient military and the ability to integrate into a larger organization is a requirement for success in a large-scale operation. On March 21 during a talk at the Atlantic Council, Chairman of the Joint Chiefs of Staff General Joseph Dunford stated that he was “absolutely confident” that the current state of reduced exercises would not result in any reduction in readiness. This sentiment is shared by retired ROK Lieutenant General Chun In-Bum. Currently, United States Forces Korea (USFK) Combined Forces Command utilizes, aside from seasonal events, “frequent no-notice alerts, musters, and operational readiness inspections to insure [sic] combat preparedness for ROK and U.S. forces.” The requirements to maintain theater-specific proficiency should remain the focus rather than the massive movements and costs associated with recreating warfare in the region. The benefit of large-scale exercises for readiness is undeniable, providing a warfare environment that is difficult to replicate absent combat. But the implementation of an Operation Plan (OPLAN) does not necessitate a dress rehearsal—it simply requires that the disparate units are prepared for integration when required. From the unit level, little is to be gained from the scale of an exercise provided that objectives are clearly defined, and units are primed for assimilation. 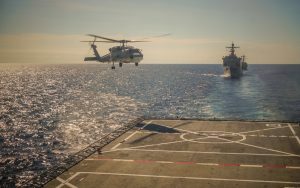 Coordination among ships and between ships and aircraft, fire support missions, amphibious assault and all other operational tasks can be assessed and practiced in reduced scale exercises and do not need to be conducted concurrently. Increased readiness can be achieved via focused events with small units which can be more closely monitored. Holding large-scale exercises has had no impact on North Korea’s nuclear and ballistic missile ambitions. Pyongyang has even conducted military provocations against South Korean assets despite the putative deterrent benefits of shows of force. Given these realities, there are other innovative and less provocative ways to maintain adequate military preparedness and readiness under the current political constraints. Utilizing exercises limited in scope, which would not compromise US national security priorities on the Korean Peninsula or the integrity of its alliance with South Korea, should be the new norm. The objective of large-scale US-ROK joint military exercises and their benefits are unclear given the disappointing results of the previous several decades. Moreover, The US National Defense Strategy dictates that the US should refocus on great power competition with China and Russia; wasting resources on exercises on the Korean Peninsula that do not maximize military preparedness does not serve this purpose. The paradigm of seasonal exercises warrants an immediate reappraisal given the current political environment and viable military alternatives.